It’s kind of a dream idea. A bit crazy, in fact — the stuff utopian ideas and innovations are made of. You might call it a thought experiment. On a massive scale. The question: What if, 50 years from now, Los Angeles were organized and inhabited as an ecovillage, or – more to the point – a federation of ecovillages? A metropolitan ecovillage of 20 million people, envisioned as a perma-circular region: What would it look and feel like? What would have to change, and why would those changes – momentous as they would have to be – offer exciting new cultural and social horizons? It sounds mad, I know. Yet it may turn out to be one of the most workable ways forward. You’ll say that Los Angeles can’t ever become an ecovillage. Ecovillages are small and radical, with a closely knitted community. 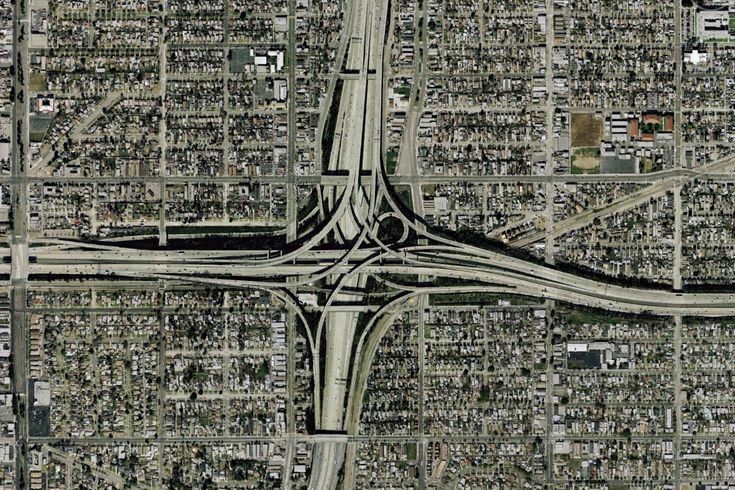 L.A. is gigantic, and totally fragmented and loose and multiple. I’m aware of that. Still, I don’t want to just use an expression such as “eco-metropolis,” because that still sounds way too mainstream – congenial, in fact, to the spaced-out imaginary of the circular growth economy pundits who love to envision thoroughly wired, “smart” megalopolises peopled by cyborgs and their myriad robot servants. No – my question is a totally different one. The presence of the word “village” is really important here. I want to imagine – with the help of as many of you as possible – L.A. as a horizontally dense network of ecovillages, each one a healthy local, perma-circular economy that remains open to its neighboring communities. I want to do this for at least three reasons. First, because I’ve fallen in love with Los Angeles and with some of its current – and past – inhabitants, among whom the folks at the L.A. Ecovillage (see my earlier post about some glimpses of perma-circular America). I also want to do it because my research and teaching work, here in Lausanne, revolves in large part around the issues of permaculture, strongly sustainable economies, and new human settlement models for a perma-circular future. I don’t think the mere notion of the “regenerative city,” interesting and important as it is, will do the job on its own; it can so easily be co-opted and twisted into the mold of growth-oriented circularity. I want to push the ecovillage idea to its maximum – the possibility for its ethics, design principles, and practical implications to become relevant for the world’s largest metropolitan area. If nothing else, we owe that to the co-founder of permaculture, Bill Mollison, who died on September 24, 2016 at the age of 88. Finally, I want to do this because I am convinced that important lessons can be drawn from L.A.’s past and present urban predicament, as well as from the ways it’s currently trying to reinvent itself – lessons, in particular, for the country where I live now, Switzerland. Let me elaborate a little bit. Los Angeles is one of the world’s largest, most spread-out metropolitan areas. Its more than 12,000 square kilometers of sprawl, home to more than 18 million people, have become the epitome of what every “horizontal metropolis” (to use my colleague Paola Viganò’s expression) fears it might become. Looking out from Griffith Observatory above Los Angeles, one surveys an almost endless gray-brown carpet with, in the distant background, a relatively small downtown district with – for U.S. standards – surprisingly discreet skyscrapers. The grid of streets and the web of snake-like highways and interchanges started replacing a top-notch metro — actually, at the time, tram — system back in the 1920s. L.A. traffic has become synonymous with the automobile’s “counterproductivity” – a phenomenon linked to generalized congestion in the industrial world, already observed and predicted to intensify by Ivan Illich in his 1973 book Energy and Equity. L.A.’s present, and already its recent past, are a measuring rod for many a contemporary metropolis’s potential future. This is also the case for Switzerland and its specific metropolitan structure. For instance, the so-called “Arc Lémanique” surrounding Lake Geneva with every more spread-out as well as dense settlements represents the paradigm of the horizontal metropolis, and some fear the “Californization of the Swiss landscape” – among them, my EPFL colleague Marc Antoine Messer, in an article where he traces the expression back to the director of the Swiss Foundation for Landscape Conservation, Dr. Raimund Rodewald. The same can be said of other parts of the so-called “Swiss plateau,” such as the Zurich metropolitan area. As population growth pressures make the horizontalization-versus-densification debate more and more pressing and polarized, L.A. looms large as a graphic illustration of what might jeopardize the specifically Swiss brand of decentralized horizontalization. The Swiss horizontal metropolis has a physiognomy distinct from the Los Angeles Metropolitan Area, but some of the issues are analogous. L.A.’s present may well be, with the suitable adjustments for topography and history, one of the Swiss plateau’s possible future. As Switzerland looks for a new concept of horizontal densification, it can and should look to the process of reinvention occurring today in Los Angeles. Indeed, in the middle of this ecological and urbanistic monster, renewal is imperceptibly taking place. From a thinly spread sprawling cityscape, it is gradually becoming a dense metropolis – Edward Soja, one of the main thinkers on L.A., called it “the densest urbanized area in the United States” in his 2014 book My Los Angeles. So an urbanistic mutation appears to be in progress. Moreover, following a long tradition of progressive activism, grassroots actors are pushing their city and its metropolitan area to slowly reinvent itself, ecologically and socially. This is the main thesis of Robert Gottlieb in his stimulating 2007 book Reinventing Los Angeles: Nature and Community in the Global City. Reinvention may be the genetic hallmark of L.A., the city of novelty, radical experimentation, utopia, and imaginary projection into the future — a better future, always, or so it seems until things, more often than not, go awry. What the LAEV is performing at a tiny scale is what is needed at the scale of the whole L.A. region. And this is where reciprocity with Switzerland can offer surprising complementarities. The strong tradition of decentralized urbanization and city-countryside mix in Switzerland has a lot to teach L.A. as its tries to finally come to grips with its structural unsustainability. Switzerland isn’t organized as a network of ecovillages, but it comes much closer to that through its specific political and cultural organization than L.A. Metropolitan Area ever has. So, as Angelenos reflect on how to start cashing in on their own long tradition of progressive activism and on how to finally begin making their city perma-circular, a crossing of perspectives might be in order. Swiss and Angelenos might start helping one another envisage their respective trajectories towards a more perma-circular future. I want to contribute to this research dynamic by launching a project that bridges our two sides of the Atlantic, our two very different urban and cultural dynamics, and our two partly similar challenges when it comes to overcoming present obstacles towards sustainability. As you can see, perma-circularity is mentioned explicitly in the course’s program, and I find that very encouraging as a positive impact of my talk at the LAEV last July. I want to continue on that path. “Ecovillage L.A. 2066” will take its cue from the L.A. Ecovillage community and attempt to build a collaborative dynamic, using their Koreatown island as the “US headquarters” – physical, but at least virtual – of the project. The Swiss headquarters will be here in Lausanne, where I am working with friends and colleagues on imagining perma-circular futures. If and when the project develops, as we go along we’ll need some financing, interdisciplinary scientific support, good communication between L.A. and Lausanne, and lots of imagination as well as enthusiasm. Curious? Interested? Want to contribute with ideas and research? Let’s make this a collaborative, bottom-up research community. Just leave a reply after this post, give me your e-mail address, and we’ll be in touch. I love this idea!! I’m so glad I saw your talk when you were in LA, I’m loving this blog!